I know, I know, I know. I don’t want to hear it! It’s been WAY too long since this blog has been updated. But man, do we have some updates!! First off, two of the GhostThunderers got hitched! That’s right, Christopher and Hannah are collaborating on their biggest project to date: a life together! Needless to say, this took a lot of our time and attention in the last year. But still, we managed to hit a ton of cons and produce some new stuff. We not only finished the first GhostThunder Presents (with an amazing cover from big shot Vertigo artist Ramon Villalobos) but we also kicked out a SECOND GhostThunder presents (this one with a stunning cover from Felicia Ann). David wrote all the stories, Hannah and Christopher both illustrated one each, with other stories illustrated by Paul Schultz, Jon Williams, and John Cottrell. We’re already at work on the third issue, keep an eye out! 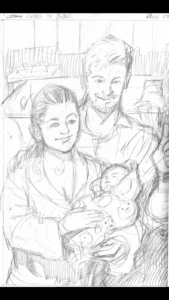 David finished the third issue in his relationship drama and the fourth is being illustrated now. There will be a VERY limited single issue run of the fourth issue once finished and then the whole series will be collected in a trade paperback (maybe hardback?) titled “The Wild Uncertain”. On a professional front, Christopher had a pinup printed in an issue of the Rick Remender and Wes Craig comic “Deadly Class” (soon to be a TV show) so that was super cool. Find it and bring it to a con for Chris to sign and watch his head explode! 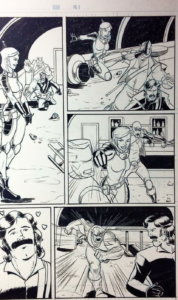 David has a short comic included in an Iron Circus anthology titled “FTL Y’all”. It was an awesome honor to be included, there were over 400 entries!! 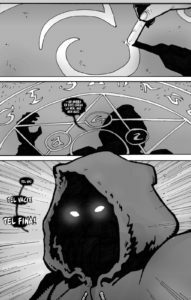 The anthology is finishing a successful Kickstarter as I write this, so look for copies at the GhostThunder booth at cons. David and Christopher are working hard on pitches for major comic companies and while there MAY be some exciting news shortly, there is nothing we can announce just yet, but follow us on Twitter and you’ll be among the first to know. That’s it for now, keep on Thundering!! 2016 has faded into our rear view mirrors. It was a great one for GhostThunder, the beginning of our third year together. We did a bunch of cons (see previous posts), had a month long art gallery show, and generally kept grinding. Before I preview some stuff we have planned for 2017, I’d like to talk more about ‘grinding’. 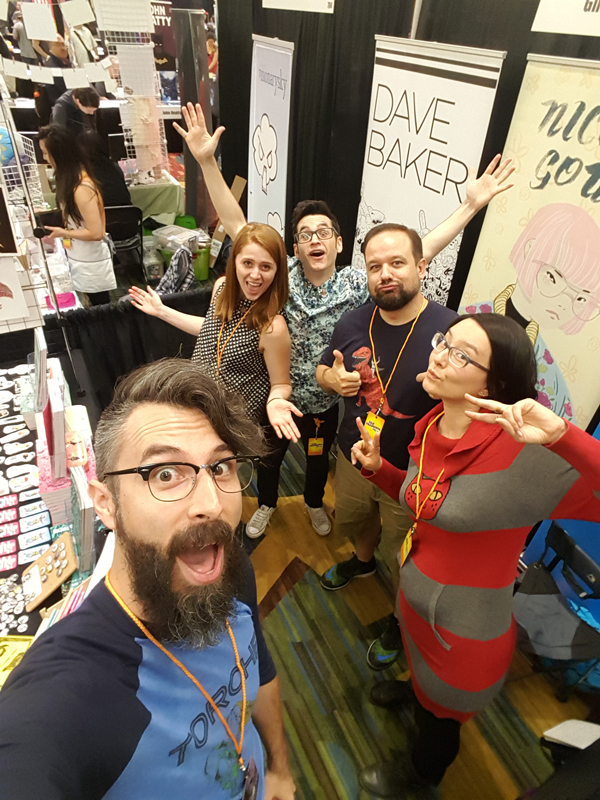 The grind (aka the hustle, working it, churning) is how indie comics people ‘make it’. Now ‘making it’ can mean a lot of different things to different people. But the grind is the grind. Spoiler here: making art doesn’t always pay the bills. Especially when starting out. In fact, sometimes making art is like digging a giant hole, jumping in, then slowly carving steps to get back out. Then, hopefully, you can use those skills you’ve learned from your time in the hole to carve your way up a mountain! Now, if you didn’t get lost in my metaphor, you have an idea of the grind. It’s creating art no matter what. Even when you are tired from your full time job. Early mornings on Saturday when you’d rather be sleeping in. When you’ve just had a fight with your significant other or your friends are calling you to go out. You just keep grinding. It helps to have a support system of other grinders so you don’t get lonely in your hole. So at GhostThunder HQ we grind together. So, what are we going to be churning out next year? Here’s a sneak peek! And of course, more cons! 2017…the grind continues! So let’s talk about APE. I think you can tell by the previous post how excited we were for this show. 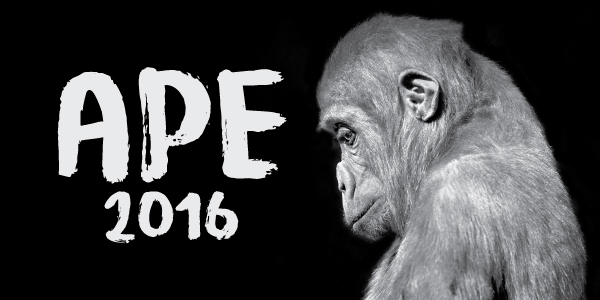 That being said, APE this year was a massive disappointment. There were far less exhibitors than last year, the space of the show floor had been cut by about a third, there were less rows and even with all these cuts, there were still empty booths. Attendance was significantly reduced compared to last year as well. So, as you could expect, our sales were about half of last year. Are sales important? Well… kinda? We don’t expect to get rich at these shows. But, we’ve spent money on printing, paying artists, paying letterers, paying colorists, shipping, travel, hotels, food, gas, tolls, etc. Plus, we’re giving up our weekends, going to work exhausted on Mondays, and typically standing all day on hard, concrete floors trying to keep positive energy up and talk to people about our products. So sales not only help offset some of these costs, they also tell us how engaged people were with our products. It’s good to feel liked. It helps those early Monday mornings, those long Sunday night drives back from shows. So yeah, pretty disappointed by APE. But here at Ghost Thunder, we don’t like to be negative, so here are some ways that APE can be saved. PROMOTION!!! Advertise the show, hire someone with experience to promote it. GUESTS!!! Tied into promoting the event, have some big name, indie creators there to draw a crowd. Regular cons have wrestlers, actors, mainstream comic names there to bring in attendees. It works. Spend a little money, bring in some creators that people want to meet and attendance will improve. CURATE!!! I shouldn’t see ‘Pixel Art’ and ‘Wall of Prints’ type booths at APE. Just no. VENUE!!! A giant, half empty building does not set a good mood for a show. And when you have panels off site, it gives people a reason to leave the con floor, and they may not come back. Also, don’t have the show the same weekend as NYCC, which has one of the best artist alley experiences of any of the cons in the whole country. That’s just dumb. San Jose can host a terrific and well attended con (see SVCC), it’s not the city, it’s what you do with it. We really hope something changes with APE, we do love this show. But as it stands now, we will not be back unless there are significant changes made. No, not warning you about King Kong. It’s Alternate Press Expo time! We absolutely love this show. It’s the one show, all year, that’s tailored exactly to what we do here at GhostThunder. The entire show is pretty much all indie creators. What that means is you won’t see Deadpool prints, almost no cosplay at all (even though we LOVE cosplay–see our store for proof!) and none of the big 2 books. That stuff is cool, but having a con where all the attendees are there specifically for the things you do…that’s amazing. It’s inspiring! We’ve met a ton of friends there and actually earned a couple of fans. The only bad thing about this show is how much money we end up spending on books, prints and goodies that the other exhibitors are selling. This are a whirlwind here at GhostThunder HQ so this blog is going to do double duty! First: San Francisco Comic Con wrap up. Man, what a great show! After some initial load in issues (seriously, 200 bucks to cart our stuff to our booth?! ), the show went well. Tons of engaged fans and positive energy all around. 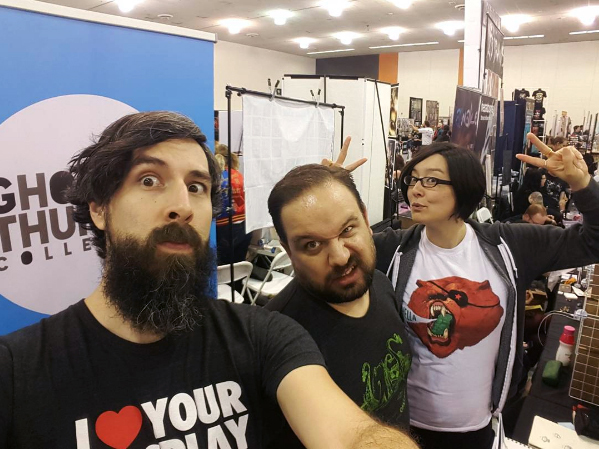 It helped that our booth mates, Dave and Nicole, are both energetic and positive people. They kept things fun and feisty. When you are exhibiting, it can be very draining, especially for a three day show! We really appreciate every single sale we make and even every person who says “that’s cool” as they walk by. So thank you SF, see you next year! Second: Crocker Con. Oh boy, this one means a lot to us. If you’ve never heard of it (and let’s be honest, you probably haven’t) it’s a small, local con at the Crocker Art Museum in Sacramento. On a Thursday night. For 4 hours. I know what you’re thinking, “Dave, what’s the big deal?”. Well, Crocker Con was GhostThunder’s first convention. So this marks our anniversary. Our third! Wow, the time flies! And it’s a terrific show, full of people who wouldn’t normally go to a convention, but are genuinely interested in art and the artistic process. And there is booze. It is also a curated show focusing on local, Sacramento creators so it’s a great place to network, find a support group of other local comics folks. We really love, love this show! If you’re close to Sacramento you NEED to get to this show! Ghost Thunder @ San Francisco Comic Con! This upcoming Labor Day weekend we’ll be tabling at the inaugural San Francisco Comic Con. I know what you’re thinking, big whoop GhostThunder, I’ve seen you guys at every freakin con in the last two years! Well, hold the phone! We have some very, very special booth mates. The AMAZING Dave Baker and the TERRIFIC Nicole Goux! They are both talented creators who have produced multiple comics together and separately. In addition to comics like Suicide Forest and Teenage Switchblade (which recently had a smashingly successful Kickstarter) they’ll have buttons, stickers and other goodies. We’re honored and excited to be sharing our booth with such a great creative duo. So now there is double to reason to come visit GhostThunder at San Francisco Comic Con. See you there! So, it’s the Monday after Stockton-Con and to fight the post con blues I’m going to go over the highlights of the weekend. Even though sales weren’t exactly what we expected, there were a ton of positives about the show. The con itself. This show gets MAJOR foot traffic. Lots of people to talk to, cosplayers galore…it’s a building full of energy. The show is very well organized and staffed. And the volunteers! Constantly bringing water, offering to watch the booth if you need a break. I’ve never experienced that at a con before and it was a real pleasure. It also runs like a big show with panels and guests (especially if you’re into wrestling), signings and photo ops. But it doesn’t price gouge like the bigger shows (*cough wizard world cough*). We’ve been as attendees before and can tell you from experience that it’s a fun show to attend. Jon Williams. No, not that one. This one: https://www.instagram.com/beefymcstudley. Jon is a good friend of GhostThunder and he shared our space doing sketches, selling prints and generally increasing the awesomeness of the weekend. Keep an eye on him, that kid is going places! Old and new friends. Cons are always great places to meet fellow creators and catch up with others that you’ve known for years. 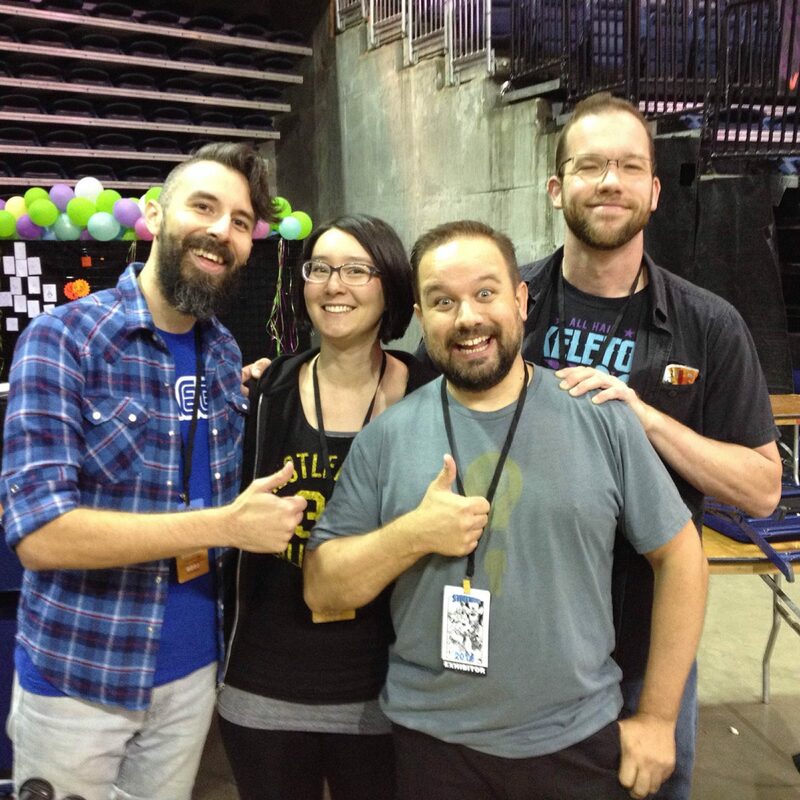 People like Ramon Villalobos, Eben Burgoon, Felicia Ann, Yosiell Lorenzo and new friends like Matt Harding and Jay Fabares make cons a much more enjoyable event for us. Wrasslin! As you can probably tell from the items in our store or if you follow us on instagram or Twitter, wrestling is a pretty big deal to us. And this show had some of our favorites of all time as guests. The Wolfpack! Honky Tonk Man! Too sweet! Tacos! So, here at GhostThunder we’re pretty big on traditions. One of which (and my personal favorite) is that as the day is winding down during a con, Christopher starts researching where our post con meal is going to be. We really don’t eat while we work our booth, we’re focused on talking to as many people as possible and hopefully selling a couple of things. So by the end of the day, we’re all pretty starving. And Christopher takes his job VERY seriously. It’s not just what is close, he’s doing some real internet forensics, digging deep into the comments, finding the truth! It’s as close to a superpower as I’ve ever seen in real life. And last night he rolled a natural 20, leaped over all the tall buildings and hit one out of the park (so many metaphors!). He led us to a place called Tacos Chapala and it truly ended the con on a high note. Perfect selection of salsas, delicious meats with excellently prepared beans and rice. I can’t stop thinking about the food! Makes me want to go back to Stockton today. A great meal let’s you forget if you had a bad day or celebrate if it was good one. That’s how we do it at GhostThunder! So that’s Stockton-Con. Hope to see you there next year! For the first time Ghost Thunder will be tabling at Stockton Con! The convention is celebrating it’s fifth year and it’s not slowing down! We’ve enjoyed Stockton Con as attendees in the past, but this time we’re behind the booth and ready to art and sell. 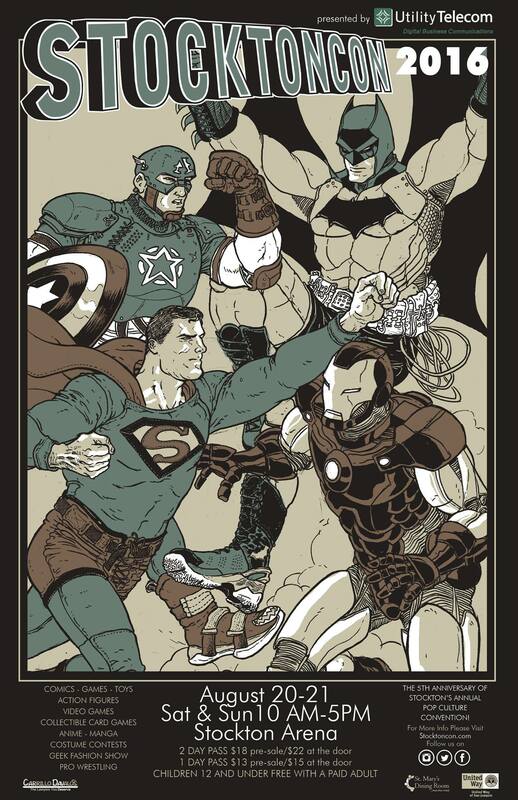 Joining us will be artist Jon Williams selling his Lil Beefies collection and dishing out great comics talk! “What’s Ghost Thunder?” That’s probably the question we hear the most at conventions. Well, the “who” is easy, just check out our bios. But, the “what”, is harder. What are we trying to do with GhostThunder? What are we trying to achieve? In the simplest, most distilled form, we’re trying to make cool stuff. Things that we are passionate about. Whether that be art prints of wrestlers or Pokémon, comics about relationships or space battles, tee shirts we’d love to wear or pins we’d be proud to display. We’re going to make stuff we think is awesome. Then, hopefully, you’ll dig it too. 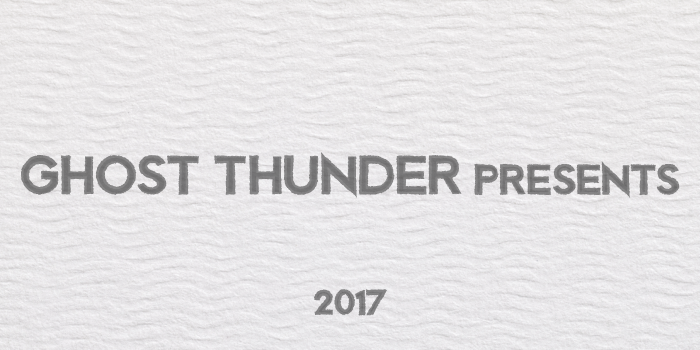 So take a look around, let us know what you think about what Ghost Thunder is.